After the ceremony, the 34-year-old said that it is hard for him to get used to see his name with a "sir before it". 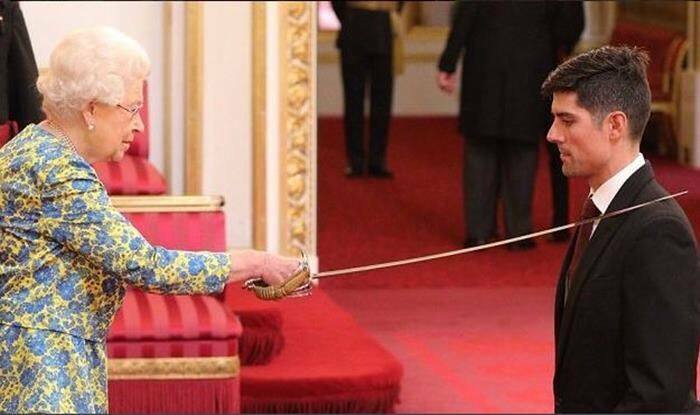 Former England captain Alastair Cook officially received knighthood from the Queen during a special investiture ceremony at the Buckingham Palace on Tuesday. Cook becomes only the 11th Englishman to be knighted for services to cricket. After the ceremony, the 34-year-old said that it is hard for him to get used to see his name with a “sir before it”. “It has been such a special day. I can’t put into words what it means, because I am not very good at that, but just for my family it has been a very special occasion,” the 34-year-old Cook was quoted as saying by Sky Sports. “I am very lucky to have this at the end of my international career. I don’t think I will ever get used to seeing my name with a Sir before it, you never get used to it. It is just weird, when you are told you have to just walk and kneel, that you should get so nervous. The cricketer retired from the Test cricket following the five-match series against India in September 2018. “You can never say no totally, because you don’t know what will happen in the future,” said the southpaw, who amassed 12,472 runs for England. “I had an amazing 12 years and had times and experiences which I could never repeat. The way I finished at The Oval was special, that will be my memory of wearing the three lions more times than I ever thought I would. He is the first English cricketer to get the honour since Sir Ian Botham in 2007. Overall, Cook is the 11th Englishman to be knighted for services to cricket. Cook, who made his Test debut in 2006 against India, captained England for a record 59 Test matches and led the country to 24 wins in the longest format of the game. He has appeared in a total of 160 Tests for the national side.